The ground-taking build-in Bluetooth controller sets Mpow apart from common waterproof bags on market. As touch-screen function is insensitive underwater, in order not to spoil the fun of taking photos, Mpow creatively equips waterproof bag with Bluetooth controller which easily controls the phone to shoot every splendid moment in the colorful underwater world. The ocean brings us much fun in the summer, while it also contains many dangers. It is important to deliver signals right away to your companion when you are in danger. Mpow waterproof case can quickly switch to warning mode by clicking the convert button, then the connected phone will flick and give out warning sound to notice others, wasting no time for rescue. Taking photos by Bluetooth controller you can get 2 photos of different styles after 1 shoot. 2. Power on the Bluetooth controller and turn on the Bluetooth function of the phone. 3. Open "Camera Blue" App. The phone will connect the BT controller automatically. 1. Please test waterproof function of the dry bag before every use. 2. As hydraulic pressure may impact touch-screen function, please take photos by Bluetooth controller underwater. 3. 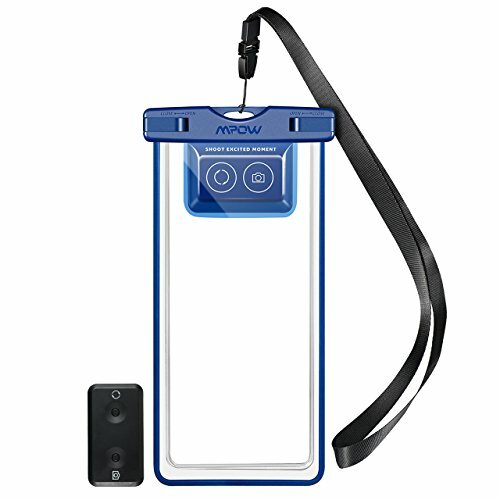 Mpow waterproof bag is suitable for phones of 6in screen and less. 4. Please read the user manual carefully before the first use. Better Performance in Underwater Photographing and Videoing. Water pressure may impact touch-screen function underwater. While Mpow waterproof pouch with build-in Bluetooth controller can easily shoot and switch modes underwater without bothered by water pressure. 5 Shooting Modes. Click the convert button to switch between 5 modes, which includes: photo by back camera; photo by front camera; video by back camera; video by front camera; warning interface. Warning Function. Notice others right away when you are in danger, save golden time for rescue. After quickly switching to warning mode, the connected phone will flick and give out warning sound to around persons. IPX8 Waterproof. Totally sealed up to 30m underwater. Perfect for swimming, bathing or even snorkeling and diving. Please test its waterproof function before every use. Wide Compatibility. Case size: 18.5×10.7cm/7.3×4.2in, suitable for all smartphones and devices up to 6in, such as iPhone X/8/8 plus/, Samsung Galaxy S9/S8/S7, Note 8, Moto, Huawei Mate, Honor, BLU, Google Pixel, Sony and more. (Big screen phones need to remove the phone case). Mpow can also protect other valuables like passport, credit card and cash away from water.